During his opening remarks delivered on the 13th of January, FFWPU-Japan President Eiji Tokuno spoke about True Parents’ expectations regarding the TOP GUN workshop participants as well as the five characteristics a Cheon Il Guk leader must have. 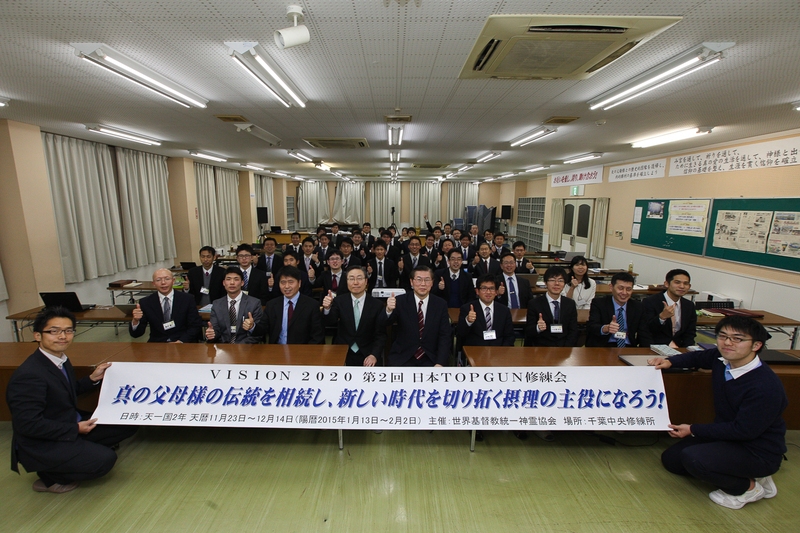 Then, the Vice-president and Youth Department Director Tanaka Domihiro added, “This year, 2,900 2nd generations will graduate from High School. To connect with these young people, we cannot continue with the ways of the past. Each one of us must become stronger. Instead of an organization, we must raise these youths so that they can develop an independent faith based on the Divine Principle.” Following the schedule of the 1st workshop, the 2nd workshop has Divine Principle lectures, True Parents’ life course lectures, Hoondok sessions on the Cheon Seong Gyeong, testimonies by elder members, speeches by senior leaders and visits to holy grounds. The participants are thus able to properly understand True Parents’ Will and values and unite with True Parents’ heart. The participants hope to develop the attitude and viewpoint that leads to the realization of Vision 2020. The difference between the first and second workshops lies in the allocation of two days’ education sessions focused on developing a principled viewpoint and applying the Principle in our lives. The participants also listened to famous lectures and had generous Q&A sessions. Furthermore, the participants are having discussion sessions and reflection times on each theme presented so that they can clearly and convincingly present the material to field members or new acquaintances. Last but not least, the participants are also focusing on prayer sessions where they develop the basic spirit and wisdom necessary to develop as a leader.